SOLUTION: Do in-depth research on the brewery with extensive sampling. Tap into our collective Catholic guilt. Then, feature the most unique aspects of The Church and its interesting brewing process. COPY: Forgive us for boasting. But, a visit to The Church Brew Works is quite a religious experience. Our unique brewpub is housed in an historic 1902 Catholic Church. It’s been splendidly restored to its former glory, right down to the European-style stained glass. Our heavenly brews are sure to get people talking, too. They’re handcrafted in the ancient traditions to tempt your palate. So come on….live a little. This is one experience in life you shouldn’t miss. 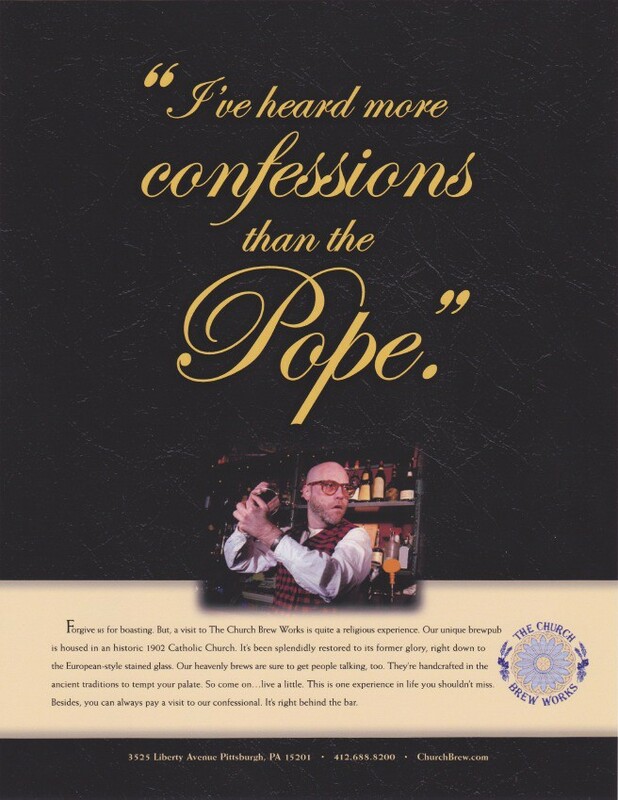 Besides, you can always pay a visit to our confessional. It’s right behind the bar.